Aroma: harsh, thick malt notes, popcorn, charred wood, fresh wood chips, lemon peel and pulp, gooseberry, apple cider vinegar, minerality, stone chips, cement plaster. All this is fresh and energetic. Taste: hot pepper, sweet lemonade, citrus candies, zest, bitter herbal tincture. Finish: sour-bitter pulp of grapefruit, zest, white pepper, spices, longer than average. In the aroma of young and fused. For 6-8 years. After a couple of minutes, vanilla and sour lemon break through with water. Some bitter grass such as calamus. But the booze remains. Sugar, a little green apple and lemon, a lot of vanilla. The finish is medium-short, but pleasant. In the remainder dryness and vanilla. If it were not obvious fuse, it would be nice. But there is no particular brightness. Honest, simple molt. This is all about simple pleasures. Malt as natural as malt can be, maybe a bit young, but with water totally accessible and quaffable. 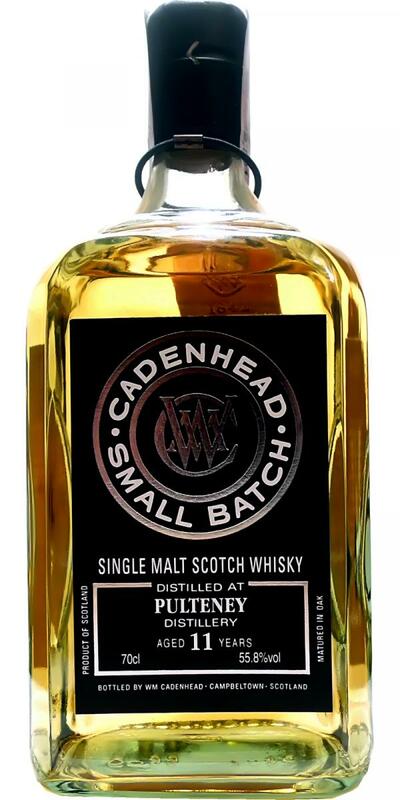 Well done, good cask selection, and probably Cadenhead has still a few casks left for further maturation of what is a very promising North Highland whisky. If you like your (high quality) Eau de Vie, you will most probably also like this a lot. Sharp, young, spirity, but also pleasantly sweet, with cotton candy, sweet barley mash, eau de vie and vanilla. Traces of ginger and candied apricots, but the untamed alcohol is just a bit too much. Much better and more accessible. Now the eau de vie notes are even stronger and very entertaining. I've got an eau de vie distilled from the fruit of European yew trees open (you can find it in Germany) that noses very, very similar! There's the same rooty sweetness, the same resinous note (but not like in older whiskies) and the same complex sour-woody profile. 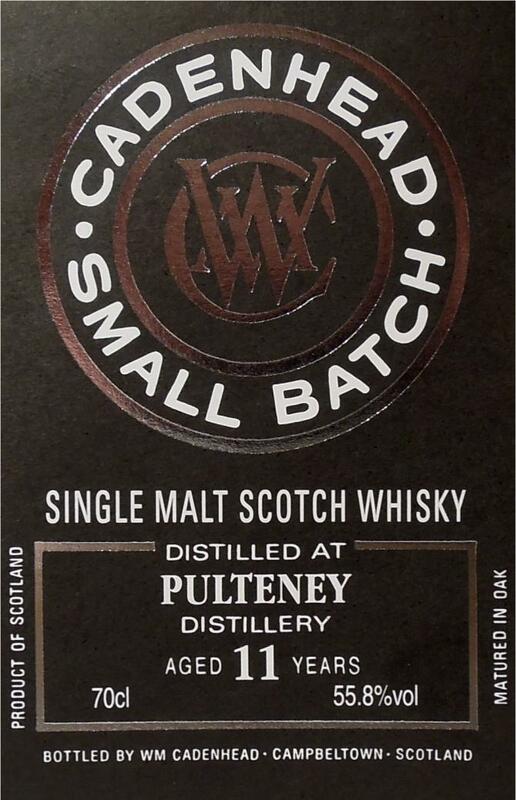 I think this is mainly due to the fresh and salty spirit from Pulteney, not a result from cask maturation. If you give your nose a chance to access this with a bit of time, it's quite rewarding and interesting for such a young malt. Strong, sour, sweet, young and steamy. You won't get a proper access to this Pulteney without water. Much better and unfolding on the tongue very nicely. White rum, starting quite simple with sweet vanilla popcorn (yes, it's there), but developing into hints of gentian and damp earth, getting quite rooty after a few seconds in the mouth, even a bit medicinal. I like that quite a lot. What an interesting little Pulteney! Medium, the rooty notes are gone, but coming back nicely together with white pepper, ginger and lychee. Simple and basic Old Pulteney but nothing offensive. Salted caramel with a nice helping of sea breeze. Clean example of bourbon cask. Peppery, vanilla with some lemon, some saltiness. Lots of pepper on the tongue. Sharp shot of wood, pepper is still there, dry oak with heat. Young, simple but great Pulteney, good hogsheads. A bit alcoholic. Salted popcorn, butter, citruses, malt and apple puree. Powerful, sweet and spicy. Milk caramel, honey, cereals, vanilla and pepper. NOSE: Toffee popcorn, cereals, barley sugar, developing rich notes with this coastal dram. The nose is great now into the palate!PALATE: The palate is driving in some incredible richness with some fresh ground black pepper, haggis crisps, cardamon pod. We also find a sweet note after this dram is left to open in the glass.FINISH: The finish is really good with a hint of red liquorice, banana loaf and marshmallow, the finish coats the palate with a lingering sweetness before the spicy mid note on the palate comes back in for a few moments.